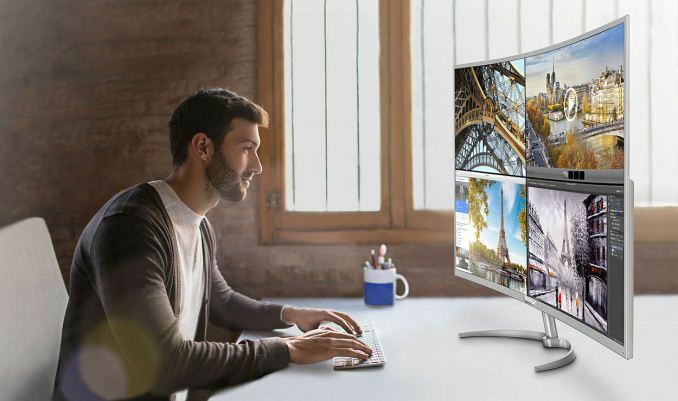 TPV Technology, the company that produces monitors under the Philips brand, this week began to sell one of the world’s first curved displays with a 4K resolution that was formally introduced at IFA last September. The BDM4037UW monitor was designed primarily for consumers seeking for UHD experience on the PC, which is why the screen is not too expensive when its dimensions, curvature and resolution are considered. Nonetheless, PBP and PiP capabilities of the display make it useful for various control room applications as well. Curved and UHD monitors are gaining traction these days because prices of models featuring good panels with decent brightness, contrast ratio and viewing angles have become more palatable in the recent quarters. However, the popularization of curved and UHD displays have been two isolated trends so far. 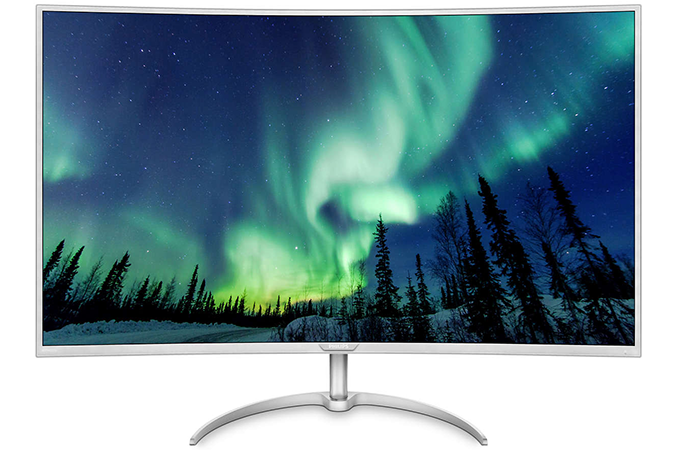 The majority of curved monitors are ultra-wide and feature approximately 21:9 (2.33:1) aspect ratio because manufacturers want users to have a more immersive experience. By contrast, flat 4K UHD displays feature an aspect ratio of 16:9. So far, no company has introduced a curved 4K computer monitor because its curvature would hardly bring a lot of advantages for 27” – 32” panels (typical for computer screens). Meanwhile, Philips decided to offer a curved UHD display that is large enough for curvature to make sense. The Philips BDM4037UW display is based on a 40” VA panel with a 3840×2160 resolution, 300 nits brightness, 3000R curvature, a 4000:1 contrast ratio, a 60 Hz refresh rate and a 4 ms response time. The manufacturer claims that the monitor can reproduce 1.07 billion colors (listed online as 'dithered 10-bit', but doesn't clarify native support) and is rated to support 85% of the NTSC color gamut. Technically speaking, 85% of the NTSC color space is wider than 100% of the sRGB color space, but what we do not know is whether the latter is officially rated out-of-the-box (and it seems odd not to confirm sRGB coverage). While the BDM4037UW is primarily aimed at consumers, one of its key selling points (apart from dimensions, resolution, and curvature) is support for Philips’ MultiView PBP (picture-by-picture) technology for up to four devices as well as PiP (picture-in-picture) for up to two devices that will be useful in various control or trade rooms where one of such displays can replace four monitors with a lower resolution. To enable PBP and PiP features, the BDM4037UW is equipped with two DisplayPort 1.2, one HDMI 1.4, one HDMI 2.0 and one D-Sub input. In addition, the monitor has a quad-port USB 3.0 hub with one header supporting fast charging. As for audio, the display is equipped with two 5 W stereo speakers. At present, the Philips BDM4037UW monitor is available in Europe. The display costs £589 in the U.K. and €749 in Eurozone. Meanwhile, it is unknown when TPV plans to start selling the BDM7037UW monitor in the U.S. as well as its pricing. he uses a tiling window manager and vim and operates exclusively from the CLI.